Save time and money, it is all in one place. Join Now! 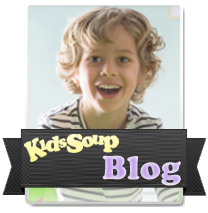 Receive access to over 10,000 preschool and kindergarten activities and resources for your classroom, home, or childcare center. 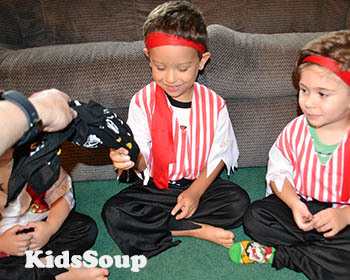 Fill a treasure box with pirate items, parrot, gold coin, treasure map, eye patch, gems, ship, shovel, etc. 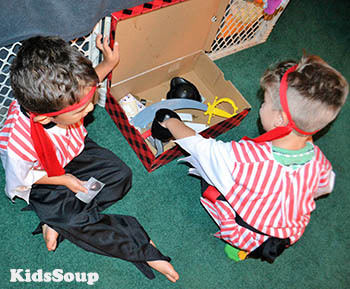 Create a picture card of each item in the treasure box. Each day, open the treasure box and take out an item. Cover the item with a piece of fabric. Describe the item and let children feel it. Let children guess the name of the object. 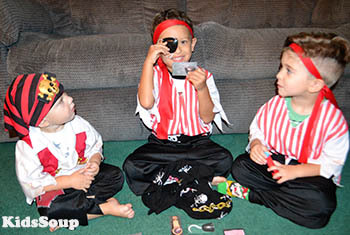 Place the picture cards on the floor and have the children help you find the card that matches the object. Say and clap the name of the object. Talk about the object, how it looks like, and how it is used by the pirates. Repeat with two other items. Repeat with different items the next day. Once all items are introduced, let children use the treasure box to match the items with the cards.